Enter the different types of deductions paid by the brokerage or agents to in-house agents and third parties (e.g., Charitable Contribution, Client Rebate, Home Warranty, Payment to Assistant, etc.). You will have the option to distribute these deductions to payees when managing commissions on transactions. Master admin can easily set up deductions on the Deductions page. There are various types of deductions that would come out of an agent’s commission or the brokerage's commission that would be paid to a third party. Some examples of deductions for your office might be charitable contributions, a home warranty, seller or buyer credits, or paying a transaction coordinator or an assistant. 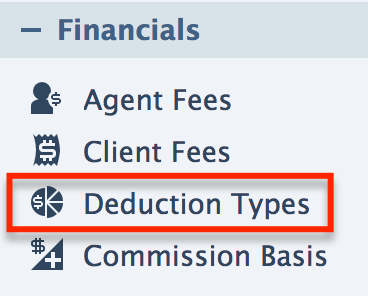 Once you’ve setup your deduction types, they will be available on the Manage Commissions page. Click “Deductions Types” from the Financials section of the left menu. Once there, you’ll see the ability to add deduction types. You can add deductions to a specific transaction while on the Manage Commissions page. Once you’ve setup your deduction types , they are accessible from the “Enter deduction for brokerage” and “Enter deduction for this agent” drop-down menus. Enter the deduction amount in the appropriate field. Specify a payee (whom the deduction should be payable to). Enter their name and contact information in the Payable To field.